Item Detail - "HOUSEHOLD OUTFITTING CO. JUNIOR SALESMAN" CHARMING BUTTON WITH VICTORIAN PARLOR SCENE. 1.5" with W&H back paper used only 1900-1901. 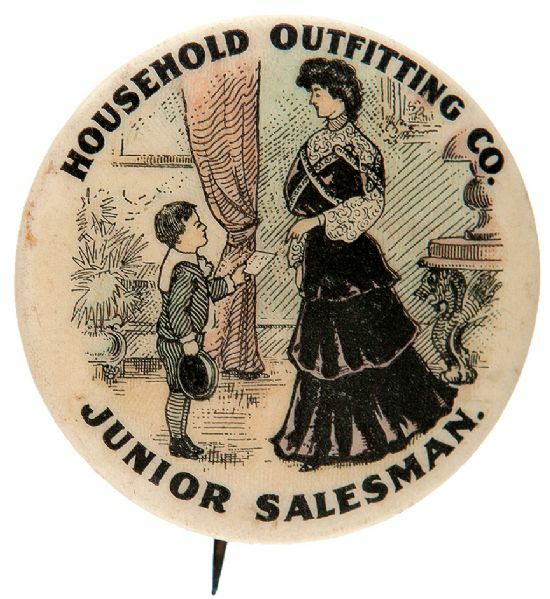 Subtle colors and great detail show young boy, hat in hand, handing a slip of paper, perhaps an order form, to stately woman in well-decorated parlor room. Very tiny age mark on extreme left edge. 99% displays Mint. Scarce.